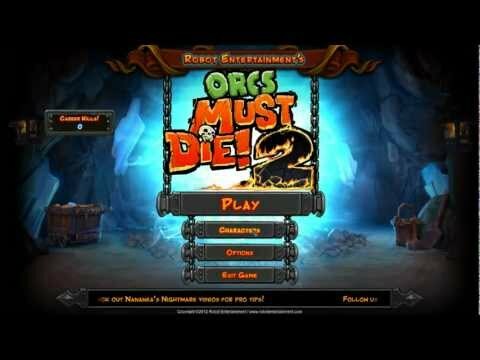 New Campaign: Orcs Must Die! 2 features a full campaign that you can play in single-player or with a friend in co-op. Choose to play the campaign as the War Mage, a headstrong hero who charges into danger, or play as the more nuanced Sorceress, a new hero who keeps enemies at bay with mind-control and magic. More Enemies: An army of vile new creatures is set to pour through the rifts, and they’ve brought all of your favorite trap-fodder from the original Orcs Must Die! along with them! More Defenses: Orcs Must Die! 2 has an enormous armory of new and classic defenses, including an all new assortment of magical trinkets. Use your new spellbook to buy defenses and upgrades the way you choose to, building up your arsenal based on how you play the game. New Upgrade System: The skull system has been completely redesigned. You will always earn skulls for replaying levels, and the skulls can be spent on multiple persistent upgrades for each of your defenses. For more info, visit Click Here! Copyright ©2012 Robot Entertainment, Inc. All rights reserved. All other trademarks are the property of their respective owners. Hints and tips for noobs?